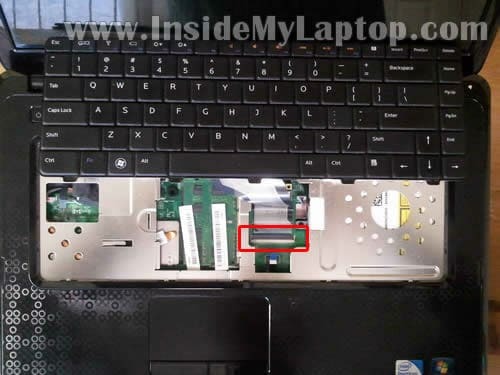 In this guide I explain how to disassemble Dell Inspiron N5030, N5020 or M5030 laptop. 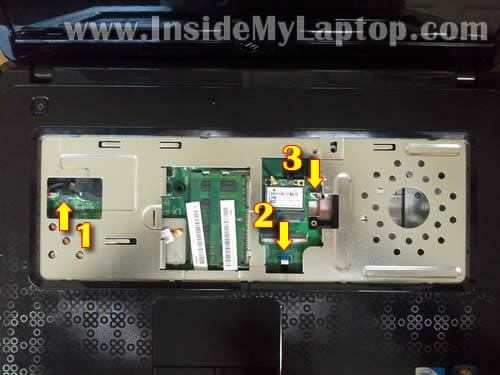 In this case I’m taking apart a Dell Inspiron N5030 but all disassembly steps should be identical or very similar for Dell Inspiron N5020 and M5030 models. 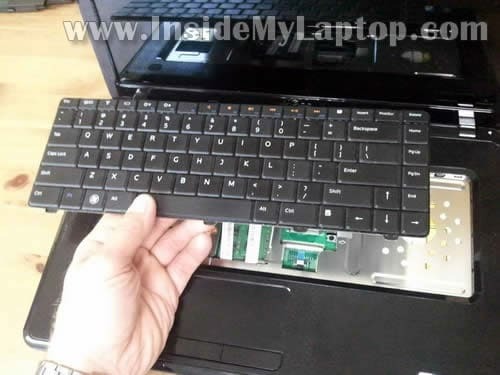 STEP 1-8: Disconnecting and removing the keyboard. STEP 9-11: Accessing both RAM modules, wireless card. Removing the DVD drive. 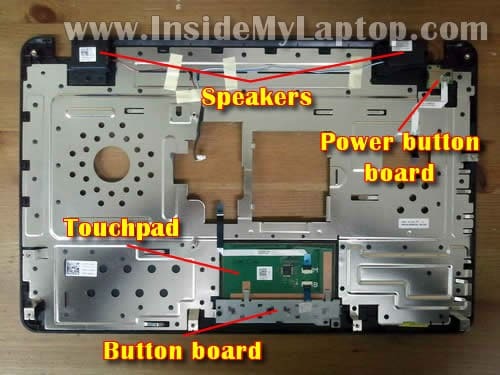 STEP 12-15: Disconnecting and removing the top cover (touchpad) assembly. STEP 16-17: Accessing most internal components. Disconnecting and removing the hard drive. Make sure the computer is turned off (not in sleep mode or hibernation mode). 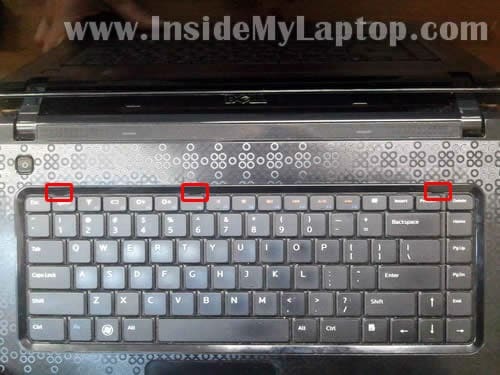 You’ll find three spring loaded latches securing the keyboard on the top. 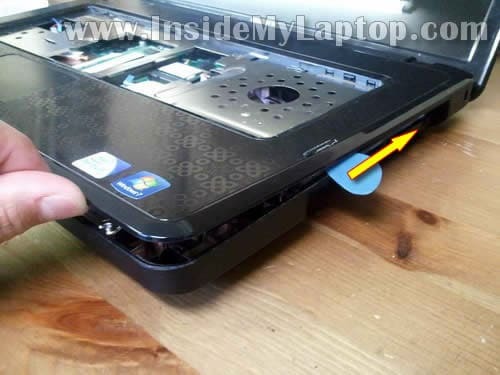 Push latches into the laptop using a small flat head screwdriver. At the same time lift up the keyboard a little bit so latches remain unlocked. 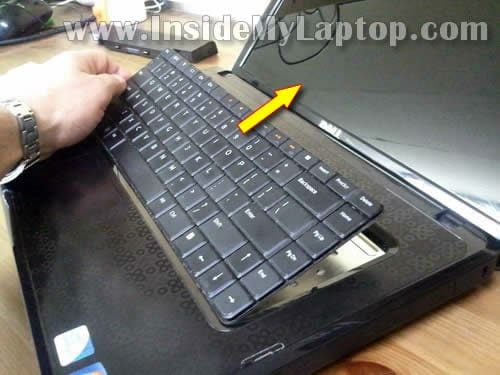 Lift up the top side of the keyboard and slide towards the display. The keyboard connector located under the keyboard. You’ll have to unlock the connector and release the cable before removing the keyboard. In the following two steps I show how to unlock the connector. The keyboard connector has two parts: white base permanently soldered to the motherboard and brown locking tab, the moving part. Carefully lift up one side of the locking tab with your fingernail. It will open up at a 90 degree angle. I’ll leave memory modules and wireless card connected to the motherboard. It’s not necessary to remove them for the purpose of my guide. 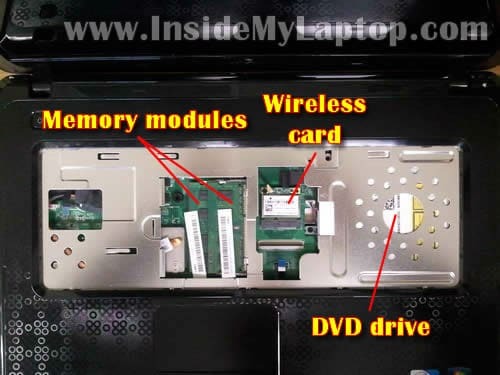 Push DVD drive from the laptop with your finger. Now pull the DVD drive and remove it. 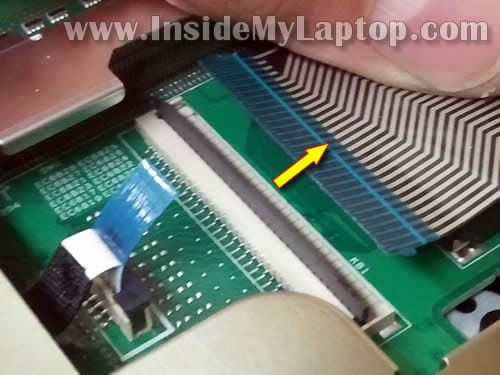 Here’s how to disconnect the power button board cable and touchpad cable. Carefully lift up the locking tab about 1 millimeter up. Do not separate it from the white base. On the following picture connector shown in the unlocked position. Now you can pull cable from the connector. The speaker cable has a regular male-female connector. Unplug speaker cable from the motherboard. I’m using the guitar pick as case cracker. 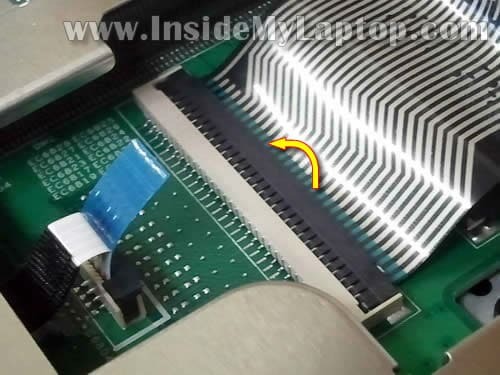 – Touchpad (sold as part of the top cover assembly). We already removed screws securing the hard drive in the step 12. 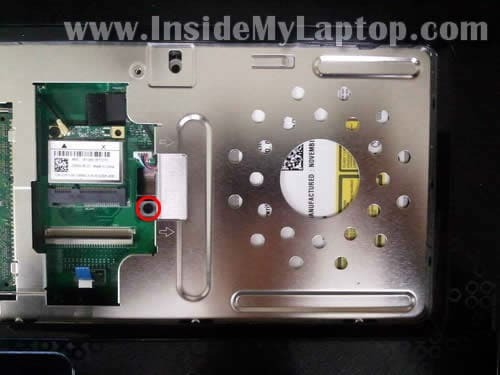 Dell Inspiron N5030/N5020/M5030 models have a regular 2.5″ SATA hard drive installed. You can replace it with any other large capacity 2.5″ SATA hard drive or SSD. 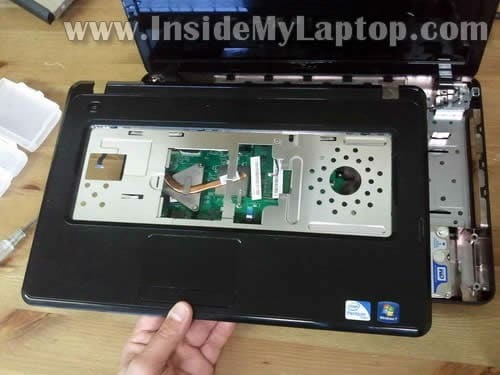 In the next guide I explain how to replace LCD screen on Dell Inspiron N5030, N5020 or M5030. I have one of these laptops that belongs to my 13 year old grandaughter (she hasn’t used it much and taken good care of it, but it’s been broken a lot. Dell used to fix it but now the guarantee is expired) Some of the keys had fallen off then it stopped working, the built in diagnostics said the hd ws gone. I like to try and fix computers (and none of us have much money to live on, let alone pay for repairs) but have never worked on a laptop. I found tutorials to take it apart, but don’t see how it’s possible to put it back together? I mean plug in the 2 tiny ribbon cables (one I think is the keyboard) with the top part close enough to connect them, with only about 1″ of space to work in? Unless maybe you do it with the keboard off? Anyway, another problem, if I buy a harddrive, is getting Win 7 back on it. I’m trying to find out if she has a reinstall CD but a lot of them don’t (my Dell XPS400 has it built in) If she has the CD okay… What I need is a harddrive and keyboard, thinking changing the keyboard at the same time, since a lot of the keys have fallen off, makes sense. The screen and everything else seemed to work good. I have the computer apart (all the screws out) just not sure, if I buy a hd and/or keyboard for it, will I be able to get it back together? Why are the cables made so short, are there extension pieces I could get, then be able to plug them back in before the top part of it is 1″ away from the bottom? There’s no way anyone can get their fingers in there and plug the tiny cable back in, that I can see. Do you have parts for this that are “affordable” and any suggestions? I have this laptop, and the mouse pad is giving me grief. I have big hands and poor typing posture so my palm always hits the mouse pad and clicks all over the place when I type. Would it be worth it for me to take it apart and disconnect the mouse pad or will that just pop error messages up at me telling me that it’s not communicating? Thanks! Great guide by the way very clear and detailed. Would it be worth it for me to take it apart and disconnect the mouse pad or will that just pop error messages up at me telling me that it’s not communicating? You should be able to disable the touchpad though software. Go to the control panel and find the touchpad (mouse) icon. Look at the settings. Also, you can disable touchpad tapping function. It’s not necessary to disconnect the cable. 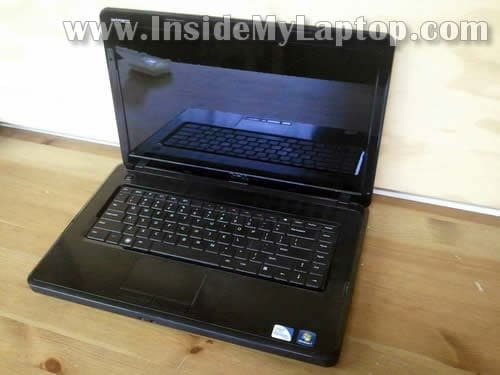 My Laptop is DELL INSPIRON N5030. When i turn it on what comes next after the Dell screen is “”KEYBOARD CLOCK LINE FAILURE” how am i to go about this? further more it tells me to resolve the issue by trying to reseat the ëxternal”keyboard. 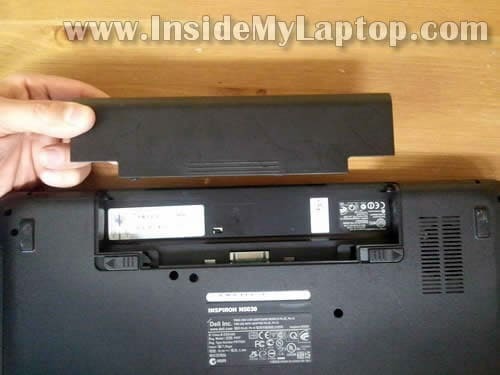 I find very helpful Thanks..
i have a dell inspiron n5030. it has been working well but recently i experienced a problem with the DVD DRIVE NOT READING THE CD. immediately the fan stopped working then the audio port stopped working. 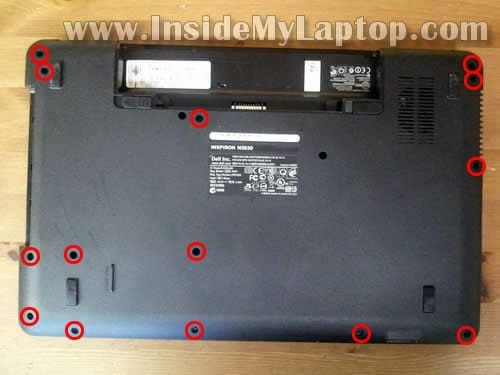 could it that the quality of the materials which were used o make the laptop were of low quality coz of the sequence of the breakdown? am worried for the loss i have incurred to fix the machine. Hi and thank you for the very helpfull post. When removing the keyboard from the motherboard, the little black tab broke. Do you know how I can remedy this or find a replacement for this little piece. Thank you in advance. B. 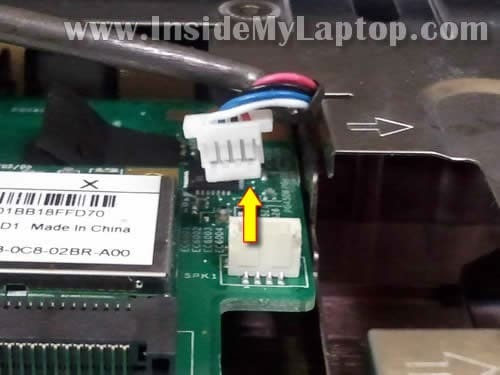 Unfortunately, in Dell Inspiron M5030 laptop the DC jack soldered directly to the motherboard. 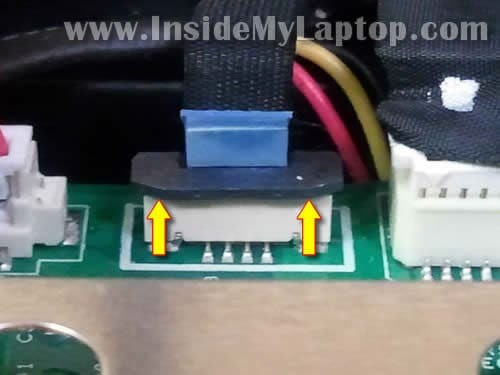 If the jack is broken, you’ll have to buy a new DC jack, remove motherboard from the laptop as it explained in the guide and replace the damaged DC jack. Replacing the jack isn’t an easy procedure and some soldering experience requited. But before you start fixing the laptop MAKE SURE this is not the AC adapter problem. Test your adapter with a voltmeter. Test your laptop with another known good adapter. Please I own a Dell Inspiron N5030. There is no bluetooth module (internal bluetooth) installed on the board what do I do please? The easiest way is buying a USB Bluetooth adapter (Bluetooth dongle). You just plug it into one of the USB ports on the laptop. My laptop screen goes black after start up. I can faintly see the image on the screen but the backlight does not work until i apply pressure with the ac jack plugged into the computer at an upward angle. The screen will come on and usually stay on for a minute or two then flicker out. As long as I keep pressure in the area of the ac jack the screen will stay lit. Any ideas? Do you mean the adapter plug will not stay securely in the socket? 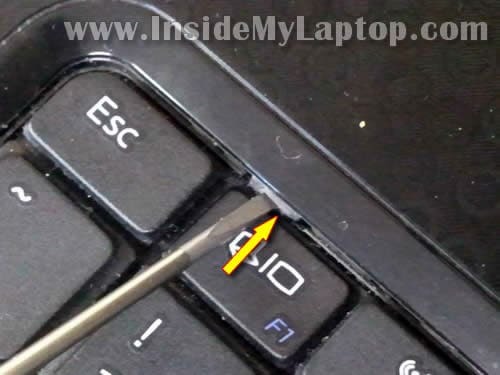 It’s either defective DC jack inside the laptop or wrong power plug for the laptop. Make sure to use an original Dell power supply and not a generic replacement adapter. You’ll have to check the sound settings. Go to the control panel and click on sound icon. In the Playback tab you should see the playback devices on your laptop. Make sure it’s set to laptop speakers. When you select the internal speakers and click on Configure you should be able to test the left and right speakers individually. Make sure all settings are correct and you can hear the sound. Also, you can try reinstalling the audio driver which can be download from Dell site here (link for Inspiron N5030). I have a quick question regarding the CMOS battery. What is it exactly, and it’s purpose in the computer. Thanks! Oh boy have I had trouble with Step 7. 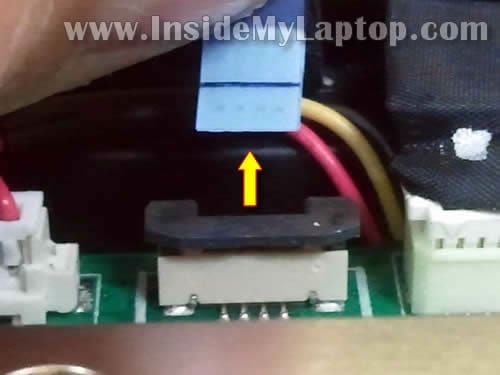 How do I get anything in through the Laptop to replace the ribbon connector? Do I take off the keyboard layer to enable this although still looks difficult. Please Help with whatever tools you may have used to get in!! Many thanks. hi,my dell m5030 keyboard is somehow misconfigured .l opened the laptop to put in a new cpu but i sort of fitted the keyboard reborn cable wrongly and the laptop stopped booting untill i tried powering it without the keyboard and it booted.lt seems l somehow was shorting it.finally i fitted the cable properly only to find that the input is not exactly corresponding to the pressed key and hence i cant punch in my password.l am stuck what should l do?is it something to do with the motherboard or the key board?should i resit something? 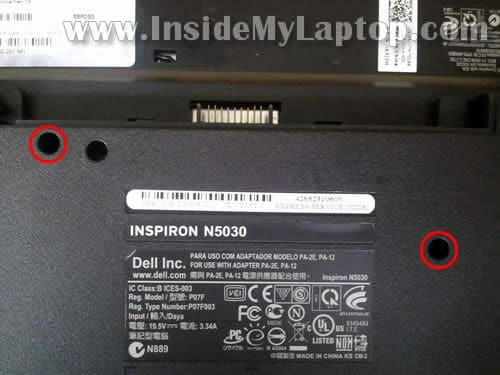 I have taken my inspiron N5O30 apart now the power strip on the inside has came away from the top of the keyboard and I don’t know how to fix it.I have tried a heat gun but been unsuccessfully at putting it back on my computer won’t turn on. Excellent guide. One addition: The screws on the bottom of the N5030 case come in TWO lengths. Two are much shorter than the rest. Make sure you get the shorter screws in the correct holes. I was able to replace my GF’s HD in less than 30 min. Be careful to use the right tools so that the screws are not damaged.